Today, I thought I'd take a little time to talk about optics. 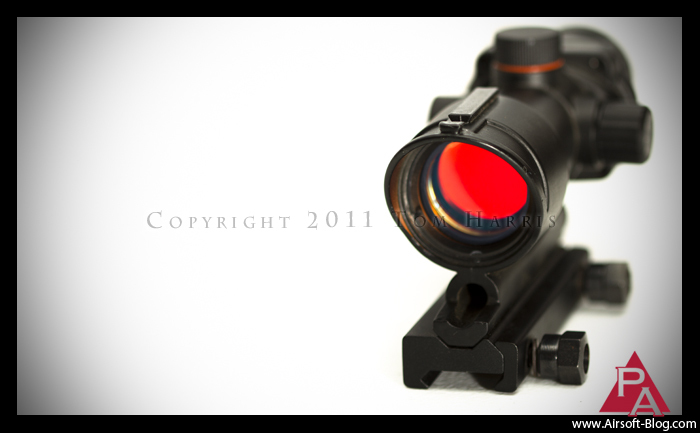 Specifically, the Sun Optics ACOG-style red/green dot sight, which is available for purchase at Pyramyd Air. I used "red/green" because Sun Optics makes two versions of the optics, one featuring a red, illuminated reticle and the other featuring a green, illuminated reticle. I prefer green, and I think most others do as well, because of its increased visibility during day time, but red was the only model available at the time I ordered this unit. 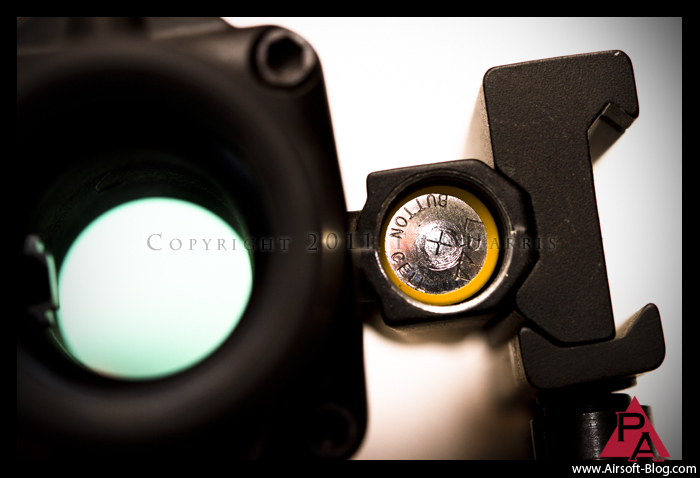 A view of the red dot sight from the other side, where you can see the two bolt knobs that allow the user to attach this optic to a standard weaver/picatinny rail or rail interface system (RIS) using the optic's integrated weapon rail mount. 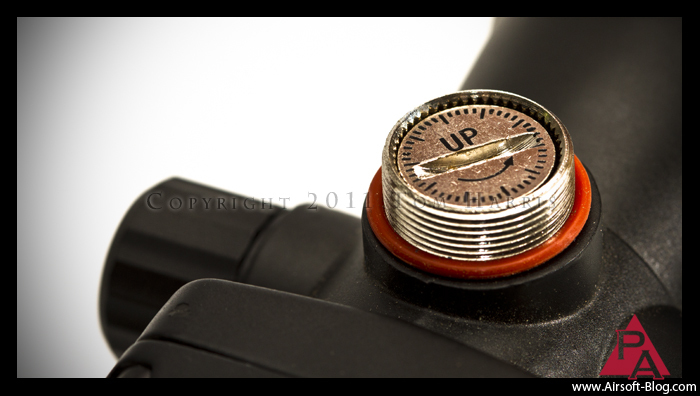 The black knob on the top of the sight is actually just a cover that screws off to reveal the elevation adjustment dial. 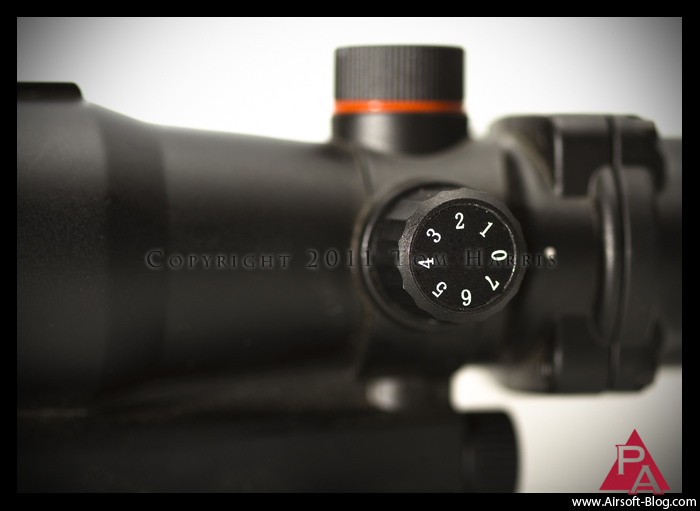 This will allow you to adjust the position of the reticle inside the scope (up or down on a vertical plane) for the purposes of zeroing in the reticle to your BBs' point of impact. This assumes you have properly tuned your Airsoft AEG so that it consistently shoots a relatively tight grouping at a particular distance. If your rifle is not tuned up and your BBs are flying all over the place, there is no point to zeroing your scope or sight. At that point, it's just for impressing your friends and enemies in the parking lot or staging area (which is important, but only half the battle). 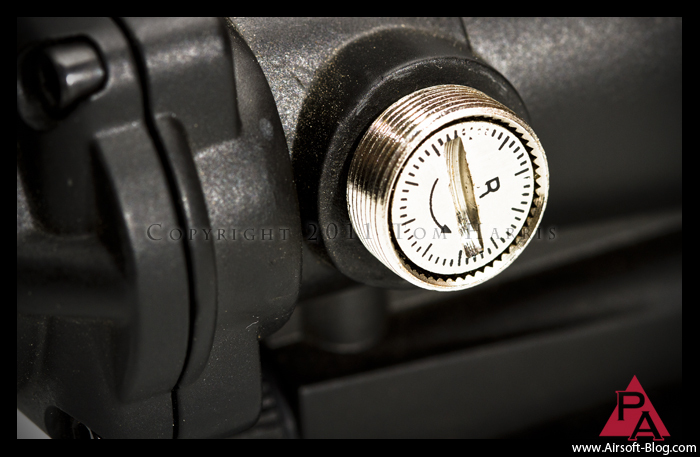 The unmarked black knob on the side of the red dot sight unscrews to reveal the windage adjustment dial (moves the reticle left or right on a horizontal plane). As I've conducted this review after testing the Sun Optics ACOG-style Red Dot Sight for about a year now, part of the "R" was scraped off over time. One turn/click of either knob in either direction is equal to 1/4 Minute of Angle (MOA). Here's a shot of the red, 25mm objective lens. Here is the 7-position "rheostat," which is just a fancy word for dimmer. 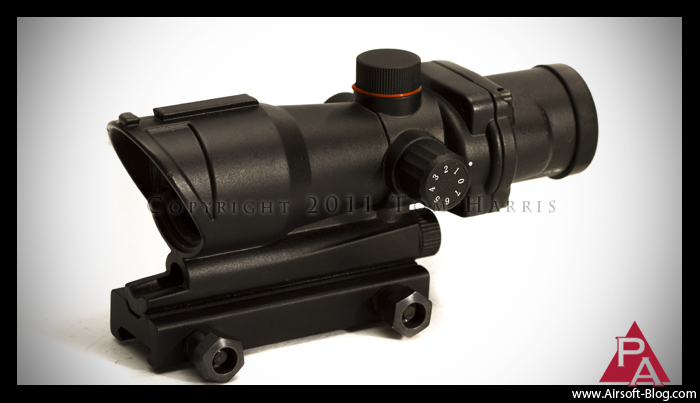 It controls the brightness of the illuminated reticle inside the optic. If you couldn't guess on your own (shame on you), "0" is the position to switch the reticle completely off. 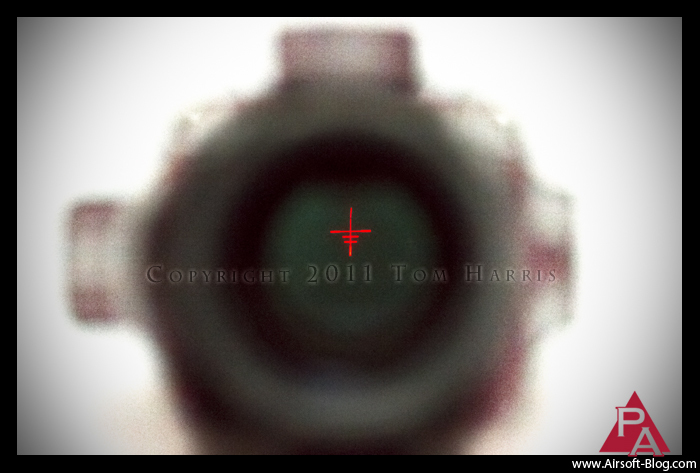 Speaking of that reticle, this particular model features a red, L1 dot, range-finding reticle. I realize the reticle does not appear to be centered in the sight, but it's actually quite difficult to line the camera up with the optic in order to accurately reflect where the reticle is truly positioned. I believe it has something to do with the fact that I'm using one lens to look through a second lens, which creates some weird geometry stuff that I don't even know about. Just check the photo to see what the reticle looks like because it's going to be different on everyone's Airsoft AEG anyway. Two tiny button-cell batteries comes with the optic and have been pre-wrapped to form a little battery pack. They are stored in a little tube underneath the big 30mm tube housing the reticle and accessed by unscrewing another little unmarked black knob on the back of the optic. Here's another shot of the tiny, button cell battery pack just for good measure. As far as battery life is concerned, I've been using the Sun Optic ACOG-style Red Dot Sight on my Airsoft AEG assault rifles for a little over a year now and am still using the same battery. I've even left the illuminated reticle "on" after the game was over, packed the gun with the optic in its case and left it alone until the following week when I would go out to play Airsoft again. I've done this several times and each time, I am rather shocked (figuratively) that the battery is still running strong. This would be me, accessorizing my Elite Force VFC HK416 CQB rifle with the Sun Optics ACOG-Style Red Dot Sight to compete in the 2011 Association of Competive Airsoft Tournament at Insight Interactive back on August 27th. 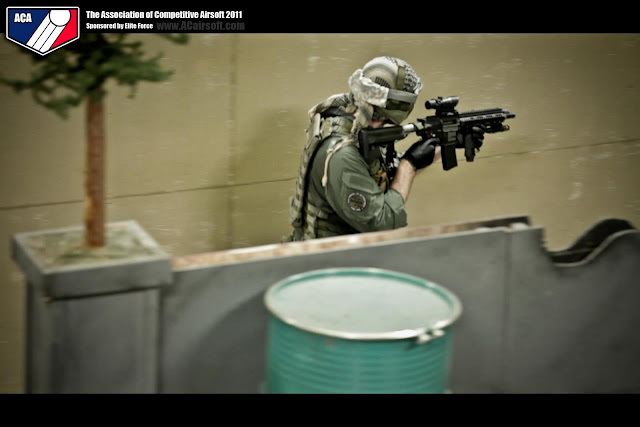 Copyright: Association of Competitive Airsoft (ACA) 2011, used with permission. 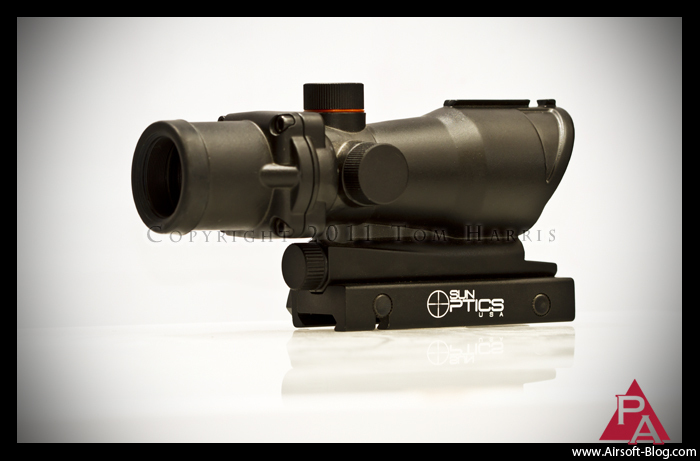 The Sun Optics ACOG-Style Red Dot Sight is a great option if you're looking for a pretty stylish optic with great functionality and reliability to assist you in dialing in your Airsoft AEG newb-zapper (or whatever else you might use it for). I've honestly had no issues with this sight outside of the normal external wear and tear from hard-charging with it on the Airsoft battlefield. Once I properly tuned my AEG for consistent accuracy, it was fairly easy to zero this thing in. I give this particular sight a high recommendation (although if I had a choice, I would have gone with a green reticle despite red being my favorite color in general).